From a humble beginning in 1990, the cardiology unit of PRS Hospital has grown into a huge flagship department, imparting patient care, education and research. 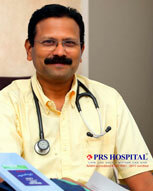 The adult cardiology unit has 4 full time cardiology consultants, and 6 resident medical officers. The unit cares for about 35,000 outpatients and 10,000 inpatients a year. 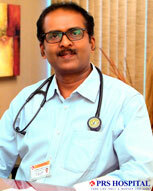 The Intensive Coronary Care unit caters to acutely ill cardiac patients. The unit has an ICCU with 8 beds and a High Dependency Cardiac Care Unit (Step Down Unit) with 7 beds. The non invasive lab OFFERS state of the art facilities including Holter monitor, Ambulatory BP, Vascular profile, 2D/3D Echo, Color Doppler, Transesophageal as well as Contrast Echos. 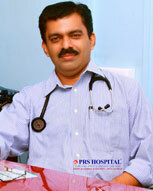 The cardiac catheterisation lab started functioning in 2007. More than 1200 angiographic procedures and 600 angioplasties a year are undertaken. The department undertakes regular scientific updates and CME for post graduate students and residents. The department involves in active clinical research with multiple phase 3 and phase 4 studies with publications in Indian Heart Journal, Advanced Journal of Therapeutics and Journal of American College of Cardiology. 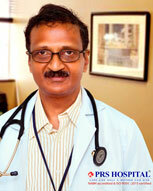 Department of Paediatric cardiology has a senior visiting consultant and an in- house consultant. 24 hour on call Echo for the sick neonate is available.